Learn about building and managing your church site here. 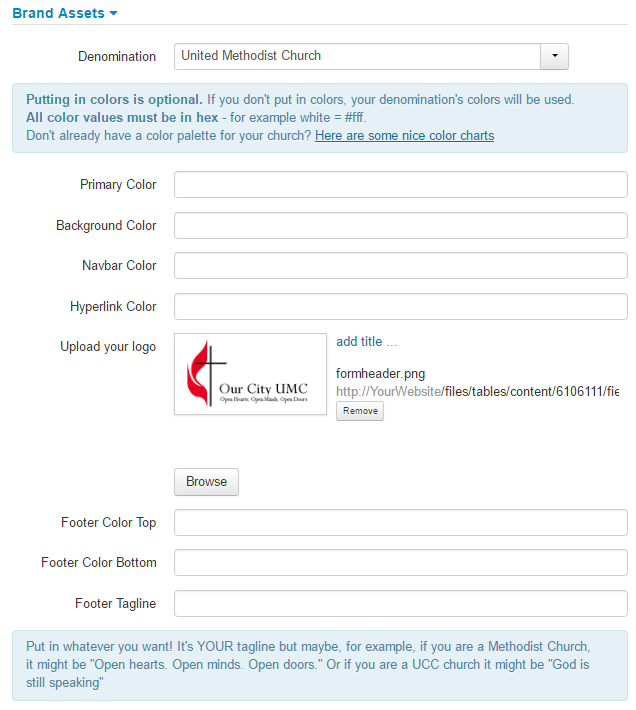 The Web Console for your Brick River for Churches account provides everything you need to manage your church website. You can use any web browser to access your web console using a URL provided when you launch your Brick River website. This URL will remain the same for the life of your account and will include your account name and terminate in 'brtapp.com'. After logging in you will land on the Web Console Welcome Page. In the top menu bar you will see the links: Content, Contacts, and Site Menus 1 . This is where you will perform virtually all of the tasks required to customize your site and it's content. Other menus contain links for managing email campaigns, creating registration forms and performing administrative tasks. On the far right corner of the Menu Bar you will find the "Me" menu 2 . Click Me and "Sign Out" to end your session and exit the Web Console. A single screen is used to set up the most important elements of your site and homepage - including color scheme, church name, logo, location, worship time, contact information, online donations and links to social media sites. On the Content Menu click the Setup link. Under the Church Name heading, click the link to your site's setup screen. After updating the desired fields. Click the button to publish changes to your website. To aid navigation the setup screen is divided into multiple sections. Click the small blue arrow icon next to titles to expand and contract the view of each section. If custom Headline and Subheading text is not entered in the Homepage and Welcome section the default subheading will be "Welcome to *Church Name*". The Church name is also featured in the website footer and browser tab. Color Fields: Enter six digit hexidecimal color codes to customize your site color scheme. Not familiar with web color codes and need some help? There are many free sites with color schemes and palettes - like this one. Upload Your Logo: Use the button to select an image file to use as your logo. This image can be square or rectangular. Footer Fields: Enter six digit hexidecimal color codes to customize the footer colors. Enter text to create a custom footer message. Address Info / Location(s): Click to add one or more locations. If valid street, city, and state information is entered, Brick River will automatically present a Google Maps link to that location. Welcome Headline and Subheading: Enter text to create a custom Headline and Subheading for your site Homepage. Photos: Click to upload photos to create a display of six image thumbnails - or - create one or more entries for an image carousel (a group of rotating photos and titles). Create a single carousel entry to use one image as a permanent large homepage header. Building / Facilities Photos: Click to upload one or more images to display indoor or outdoor images of your church on the homepage sidebar. Photo Album Featured on Homepage: If you have created one or more photo gallery posts click to choose a gallery to display on the homepage. Click the "create a new post" link to create and a display a new photo gallery. Optional New People Text: Create text and / or relate FAQ's here to enable a welcome message for new and prospective members on the left sidebar of the homepage. Homepage FAQs: FAQs are simple content documents containing a question and its answer. They can be displayed on the Homepage by selecting them here using the button. You can create and edit FAQ's by clicking the Content Menu and selecting FAQs. You can also click the create a new faq link here to create a new FAQ and link it to the homepage in a single step. Click the breaklink button to remove an FAQ from the homepage. Social Media Fields: Enter links to Facebook, Twitter, Instagram, and YouTube accounts. Each entry will enable a link to that site on your website title bar. A link to Facebook will also enable a Facebook post display to appear in the left sidebar of the homepage. 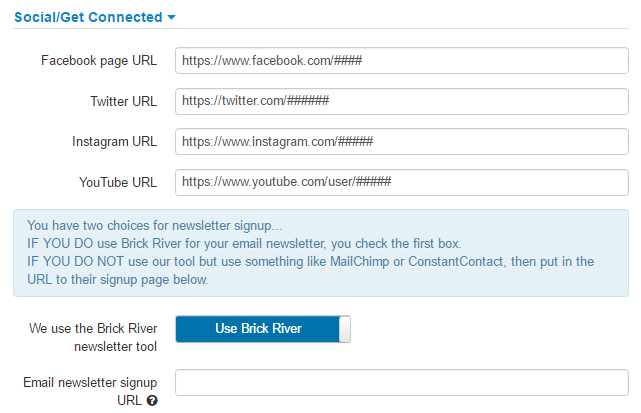 Newsletter Fields: Use fields to enable links on the homepage for users to subscribe to your Brick River or other newsletter mailing list. Giving / Donating URL: Enter a link to the service you use for online donations. This will activate the display of a Giving link on your website title bar. Enable Members Area: Set this to Active to enable use of your website private portal. This will activate the display of a Log In link on your website title bar. The private portal can contain posts and a member directory that is only accessible to users who log in to your site. You can add links to one or more people to add 'Featured Members' to homepage. Many churches use this feature to display a cross section of the church's population so new members feel welcome to attend. Click to link an existing person to the homepage. Click the add a new person link to create a new person and link them to the homepage in a single step. This section displays information about when the Setup screen was created and last updated. 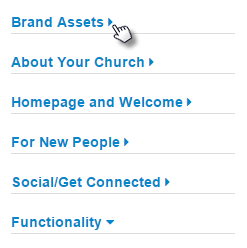 To manage your site's Menus and Pages, click the Site Menu and click the link to your church site. This will open a Site Map which displays your site pages. By default all top level pages appear as links on your site's menu bar. If a page has sub pages (also called child pages) these will be displayed to users on a drop down menu when they click the parent page link on menu bar. Click the Go to Site 1 link to open the site homepage in a new browser tab. Enter a page name 2 to search for a specific page. Click Show Deleted 3 to reveal pages which have been deleted from the site. Click any existing page 4 to Edit, View, Move, or Delete a page. Click New Page to create a new child page beneath the selected page. Click the Edit link 4 to open an existing page in the Page Editor screen. There are three tabs to perform various tasks on the Page Editor screen. The Design tab contains all the tools to add and format page content. Type content in the editable portion of the page and use buttons on the toolbar to format text, apply headings, add insert images and links. Click here for a list and description of all the available design and formatting tools. The Source tab displays page content in its raw HTML form. This view is for designers with experience working with HTML, CSS and other scripting languages. 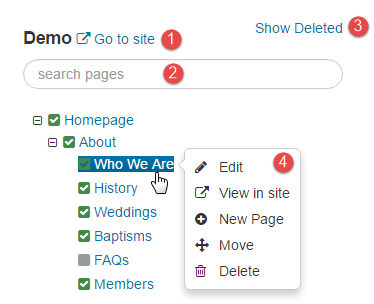 The Properties tab has fields to edit the Page title, friendly name and sort order of the page on site menus. Click to save your changes without updating the site. Click to save changes and update your site. Click to return to the sitemap screen. Most of the dynamic content presented on your site will be created as Event and Post records. Dynamic content is content that changes on a daily, weekly, or monthly schedule. Rather than update site pages to include all this time sensitive information - it is almost always easier to create Events and Posts using links on the Content Menu. Click the button in the Events View or Posts View. Add the desired content. Click to save changes. Click the link to the desired content from the Events View or Posts View. Edit as desired and click to save changes. Open the desired Event or Post. Click the button and choose Delete. Confirm to delete the content permanently. Upon creation will default to be invisible - to not appear on your site. This allows users to create, edit and save content - but not display it on the site until it has been proofread or approved. Set the Visible field to Visible to display the content on your website. All visible content will be updated automatically on the site when the content is edited and saved. Event content that is made Visible is displayed on the website Event Calendar according to the Start and End times of the Event. Events can be made recurring using the Recurrence button and setting the parameters for recurrence. Set one or more Calendar Category Tags to allow users to filter the site calendar to only display one category of events. Events with no tags will display when the calendar is set to display All Events. Posts are displayed when users click the News and More link on the website toolbar. You can set a post to appear prominently on the home page by making it a Featured post. Slide the Feature This field to 'Featured'. The home page will display the post Title, Primary Image, and Summary on the website for two weeks following the posted on date. Use the button to optionally link a scheduled event link to the featured post. Each post must use a single Post Type. Users can filter their view of News and Features to only display one type of Post. Member Portal Posts will not appear with News and Features. Only users who log in to the website private portal can view Member Portal Posts. Managing People profiles is very similar to managing Events and Posts. On the Contacts Menu, click People to display People Profiles for your site. People profiles can include People you wish to display on your website, such as clergy and staff; church members you wish to display in the church directory, and people that you wish to include on email lists used by Brick River. You create, edit, save and delete people using the same techniques described for Events and Posts. Add letters or numbers to the Sort Order for Staff Listing Field to achieve the desired sorting of people on the website. 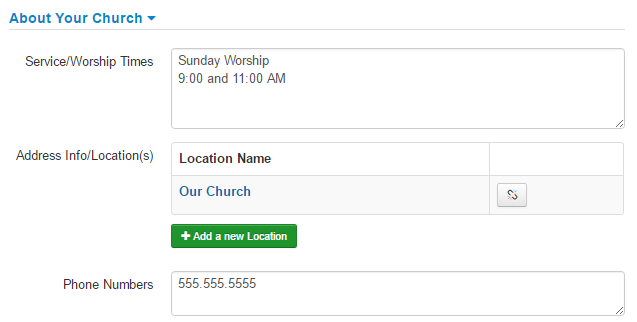 Add tags to the Exclude from Church Directory field as desired to prevent display of phone number, email and other contact information in the directory. Configure domain pointing records with your Registrar - the company where you purchased your domain name. It is usually necessary to create an @ record and a C record. Each Registrar provides there own set of tools and processes to do this.